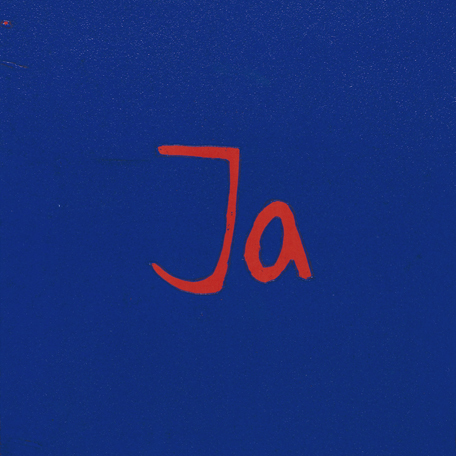 Remarks: In Praise of "JA!" The following remarks were delivered by Fionn Meade, artistic director at the Walker Art Center, at a program taking the form of a dinner that coincided with the exhibition Andrea Büttner. It is presented along with remarks by fellow speakers at the dinner: curator Lars Bang Larsen,Auburn University associate philosophy professor Keren Gorodeisky, and forager and nature enthusiast Elijah Ferrian. To start off my toast this evening, I want to acknowledge the moss garden that we’ve brought into being over the past months and that now marks the entry to Andrea’s exhibition. I’d like to offer a tribute to its “bold little beauty” as written by the American poet Emily Dickinson within a poem sequence dedicated to Nature and published as it were almost 120 years ago in 1896. It is fittingly a leap year that we are in as we gather on a cold November night to celebrate Andrea’s exhibition at the Walker, her first solo exhibition in the United States. More specifically, on February 29, 2016, in what will still feel like winter, we will have our leap year moment, a punctual hole in the calendar during the run of the show. As we are here together, I invite us to think through this addition beyond the usual calendar and toast to this “pink, small, and punctual” fact of the year ahead, time that leaps from the earth askew and revitalizing, just the right imbalance to remind us to keep meaning and direct communication at the fore over the upcoming seasons. Let us toast to this extra time that keeps us seasonal, that keeps us with and close to what Emily Dickinson aptly describes as the bold little beauty we should all hope to be bedecked with! And so these remarks on “JA” take permission from Andrea’s embrace of the word “JA (YES)” at regular moments in her work. The “JA” of this evening asks us to leap from one thing to another and celebrate the linking with such permission, allowing a space in between, the kind of in between permission that Andrea asks of each of us regularly in her work, the permission to leap and connect, to encounter both difficult and warm things, and to accept both. Andrea is not afraid of history and brings a readiness equally to both the tactile surface of her material choices, sharp and reduced compositions, and to the concentric rings of research and questioning that characterize many of her projects. I can readily attest that Andrea is not afraid of being and experience, and to be at large in the world. To be ‘at large’ is a phrase I’ve been thinking about during Andrea’s presence over the past two weeks leading up to the opening of her exhibition. 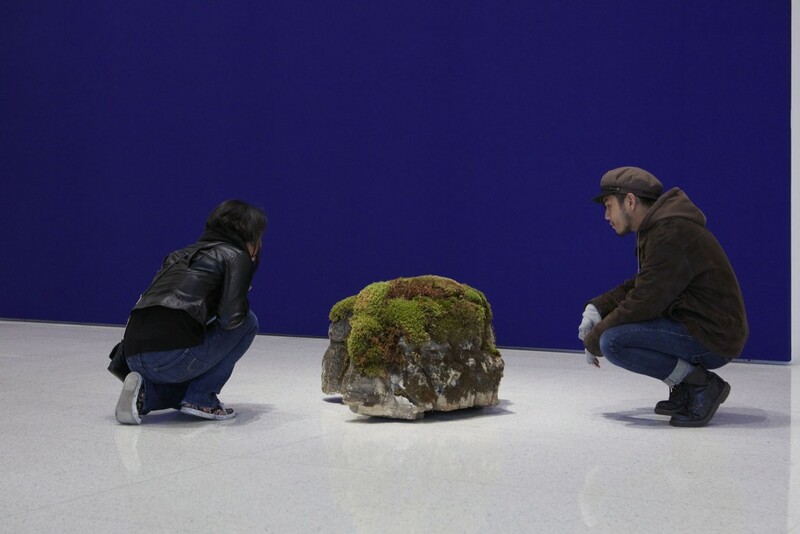 From the enfolding gesture of the blue fabric walls that now ring Burnet Gallery, to the enlarged smear and stain of “desire/search/knowledge” within her new enlarged smartphone etchings, to the exposed gesture of the moss garden to the white walls and terrazzo floors of the Walker galleries, a garden with no space for withdrawal, no moisture. Throughout the exhibition, the arms of each work are open to and facing each other with clear lines and difference. With a calm and clear eye. And this response to the stone and pebble that cannot be tamed by the human eye is the “JA” of life that Andrea so regularly reminds us of. This is the “JA” of being and experience, and the threaded connection that exists and must be traced between forms of life, forms of thinking, and forms of feeling. When Andrea herself writes that: “Shame marks the threshold of visual representation and might at the same time be impossible to represent. Shame means that we resist what we desire,” she puts us squarely in experience, and challenges us to respond with a series of “JA” moments, acceptance and acuity, the specificity demanded of living and thinking as equal demands, the enigmatic move around negation toward something more affirming that approaches an admixture of divestment and acceptance. Indeed, as Milosz continues in his musing: “What is this enigmatic impulse that does not allow one to settle down in the achieved, the finished? It is a quest for reality.” For reality does not leave us with a no, but with something else, with the “JA” sequence of being and experience. Andrea challenges us to pay attention and be present with what we show and what we hide, what we expose and what we veil, to be ventriloquist, and adopt other voices, other genders, other life forms in our quest for reality. Indeed, to bring these into close contact with each other, to allow for shared experience and research to be imprinted by each other. And so I hope you will indulge one more ventriloquist gesture as I read part of a passage from one of the great “JA” detours in all of literature, the close of Irish novelist James Joyce’s Ulysses, also invoked by a leap year and the skip and jump of divestment, and the breathing in and exhale of Molly Bloom’s soliloquy.